According to USA Today, Cyclone Chapala was the second-strongest cyclone on record ever to hit the Arabian Gulf. 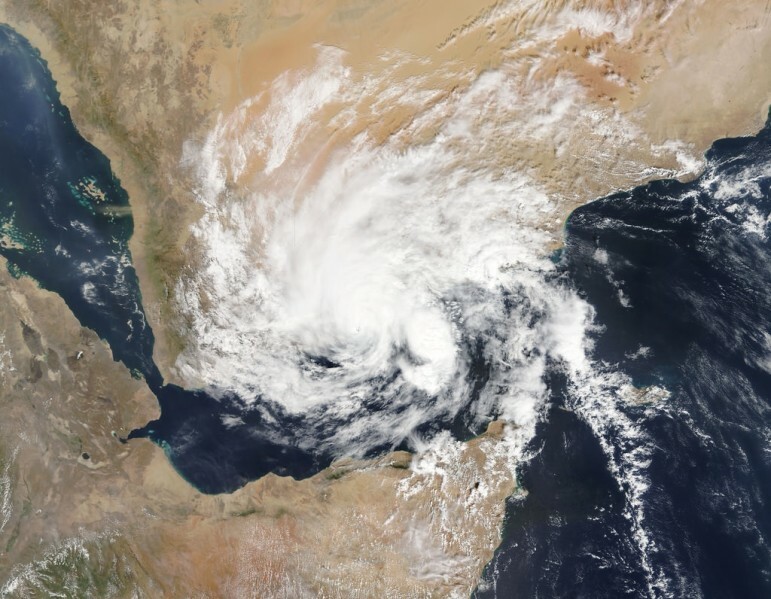 The storm hit the coast of Yemen, causing numerous deaths and massive destruction from wind, rains, and flooding. According to CNN, the storm dumped two or three times as much rain in just one day as Yemen gets in an entire year. The United Nations estimated that 40,000 Yemenis on the mainland and on the Yemeni island of Socotra have been displaced or temporarily relocated due to Chapala. Aid is beginning to be sent to Yemen from Oman and the United Arab Emirates, but Yemen was already a humanitarian aid crisis spot before the cyclone hit. As of August, as a result of famine and other conditions exacerbated by a civil war abetted by actions conducted by the Yemeni government, Houthi rebels, the presence of an Al Qaeda affiliate, and a bombing campaign conducted by Saudi Arabia and its Gulf allies, the United Nations’ humanitarian coordinator described Yemen as a “humanitarian catastrophe.” According to the BBC, “the destruction of infrastructure and restrictions on imports imposed by a Saudi-led coalition carrying out air strikes against the rebels have led to 21 million people being deprived of life-sustaining commodities and basic services.” That is out of a total Yemen population estimated by the BBC of 26.7 million. Our nation knows what’s going on. According to a fact sheet on the USAID webpage, “rising fuel and food prices, high levels of unemployment, conflict, and conflict-related displacement have left nearly half of Yemen’s 24.8 million people food insecure, of which 1 million children suffer from acute malnutrition—the second-highest child malnutrition level in the world.” (USAID uses a different population number than the BBC for a country that has porous desert boundaries and nomadic tribes). It should be no surprise that according to the European Union Yemen always ranks just about next to the top on the list of nations regarding global vulnerability affecting humanitarian relief strategies.